We are now less than two months away from our very first full power radio barnraising. 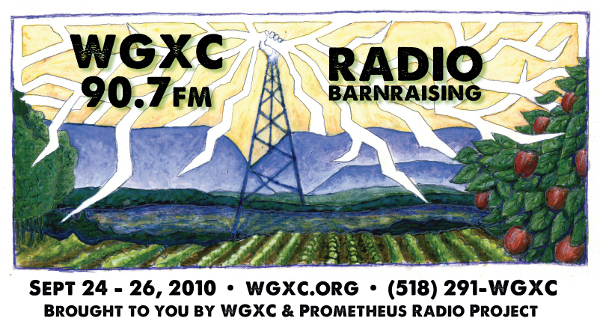 At over 3000 watts, WGXC will reach nearly 80,000 people! Join us in the Hudson Valley! Meet other folks from low power radio stations, full power community stations, community media makers, educators, and activists of all stripes. Workshops will cover topics including radio production and programming, technical and station organization issues, radio as a tool to organize communities, youth radio, transmission arts, and radio theater. Come prepared to pick up a soldering gun, eat scrumptious local food, and celebrate the birth of WGXC 90.7 FM- a brand-new community radio station! If you haven't already done so, please REGISTER NOW for the WGXC full power barnraising. Still unsure what a radio barnraising actually is? Check out this short video of our 2006 barnraising with PCUN (the fantastic farmworkers union in Woodburn, Oregon): ¡Ya Se Pudo!